Listen to a kid explain life in Ancient Egypt. Write your name in hieroglyphs. Compare everyday life for rich and poor Egyptians. Find out how a mummy was made. Watch a video about the Great Pyramid of Giza. What were the pyramids for and how were they built? Fun facts about Egyptian gods and goddesses. Take an Egyptian art lesson, and draw pictures of ancient Egyptian gods and pharaohs. Colourful scenes with flaps to reveal details of life in Ancient Egypt. 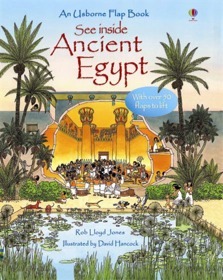 Each bustling scene is packed with information about life in Ancient Egypt, including worshiping in a temple, building the pyramids, and farming and trade along the River Nile. Includes simple, informative text and picture labels. Over 50 flaps to lift to reveal fascinating facts. Piquing a child's curiosity by allowing them to explore various historical scenes, the hidden elements on the page really feeds their imaginations and provides more engagement with the subject matter... We love the astonishing attention to detail here, and the cheeky humour in places too!